A team of Yale University scientists has synthesized for the first time a chemical compound called lomaiviticin aglycon, leading to the development of a new class of molecules that appear to target and destroy cancer stem cells. Chemists worldwide have been interested in lomaiviticin's potential anticancer properties since its discovery in 2001. But so far, they have been unable to obtain significant quantities of the compound, which is produced by a rare marine bacterium that cannot be easily coaxed into creating the molecule. For the past decade, different groups around the world have been trying instead to synthesize the natural compound in the lab, but without success. "About three quarters of anticancer agents are derived from natural products, so there's been lots of work in this area," Herzon said. "But this compound is structurally very different from other natural products, which made it extremely difficult to synthesize in the lab." 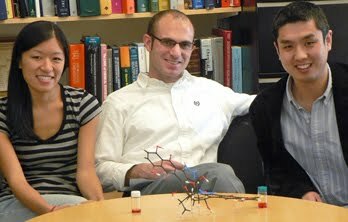 In addition to lomaiviticin aglycon, Herzon's team also created smaller, similar molecules that have proven extremely effective in killing ovarian stem cells, said Gil Mor, M.D., a researcher at the Yale School of Medicine and Yale Cancer Center who is collaborating with Herzon to test the new class of molecules' potential as a cancer therapeutic. The scientists are particularly excited about lomaiviticin aglycon's potential to kill ovarian cancer stem cells because the disease is notoriously resistant to Taxol and Carboplatin, two of the most common chemotherapy drugs. "Ovarian cancer has a high rate of recurrence, and after using chemotherapy to fight the tumor the first time, you're left with resistant tumor cells that tend to keep coming back," Mor explained. "If you can kill the stem cells before they have the chance to form a tumor, the patient will have a much better chance of survival — and there aren't many potential therapies out there that target cancer stem cells right now." Herzon's team, which managed to synthesize the molecule in just 11 steps starting from basic chemical building blocks, has been working on the problem since 2008 and spent more than a year on just one step of the process involving the creation of a carbon-carbon bond. It was an achievement that many researchers deemed impossible, but while others tried to work around having to create that bond by using other techniques, the team's persistence paid off. "A lot of blood, sweat and tears went into creating that bond," Herzon said. "After that, the rest of the process was relatively easy." Next, the team will continue to analyze the compound to better understand what's happening to the stem cells at the molecular level. The team hopes to begin testing the compounds in animals shortly. "This is a great example of the synergy between basic chemistry and the applied sciences," Herzon said. "Our original goal of synthesizing this natural product has led us into entirely new directions that could have broad impacts in human medicine."